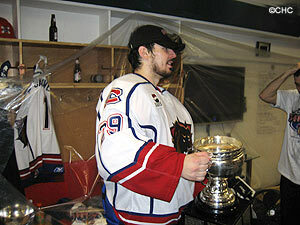 A champagne-soaked Carey Price spends a little quality time with the Calder Cup. HAMILTON (CP) - Ajay Baines scored a short-handed goal at 9:33 of the third period, giving the Hamilton Bulldogs their first American Hockey League title Thursday with a 2-1 win over the Hershey Bears. It's the franchise's first Calder Cup in its 11-year history. Hamilton, the affiliate of the NHL's Montreal Canadiens, won the decisive Game 5 of the best-of-seven AHL final in front of a crowd of 14,205 at Copps Coliseum. Hamilton's Maxim Lapierre, who opened the scoring in the second period, burst down the right wing and sent a perfect feed across to Baines, who buried the puck behind Frederic Cassivi. Hamilton lost to the Hershey Bears in the 1997 final and again to the Houston Aeros in a dramatic seven-game series in 2003. Jakub Klepis had the lone goal for Hershey, which produced a much better effort than in Games 3 and 4 but still had trouble beating goalie Carey Price. Price, who was named MVP of the Calder Cup playoffs, made 29 saves. His stops included a pad save on Klepis, who fired a hard shot at the Bulldogs' rookie in the opening minutes of the third period with the score tied 1-1. He also stopped a hard point shot from Mike Green in the closing minutes with Hershey looking to tie the game. The Bulldogs enjoyed some early chances, but unlike the previous two games at Copps Coliseum they failed to get on the scoreboard in the opening minutes. Hershey, after looking sharp killing a Bulldogs' man advantage, went on their own power play and nearly took a lead midway through the first when Tomas Fleischmann's hard shot from the faceoff circle was tipped in front, fooling Price but ringing off the far post. The Bears' Chris Bourque had another great opportunity short-handed moments later when he stole the puck off Mathieu Biron and went in alone, but Price gave the Hershey forward little room to shot and denied him with a solid save. Cassivi looked decidedly better in the Hershey net, rebounding from a poor performance in Game 4, in which he allowed five goals on 25 shots. He stopped 24 of 26 shots and came up big for the Bears in the latter part of the second period, keeping the game scoreless with a few timely saves as Hamilton pressed to establish a lead. With both teams fighting to secure the crucial first goal of the game, it was Lapierre that opened the scoring at 14:37 of the second period. Hamilton defenseman Andre Benoit, who helped set up three goals Wednesday, skated behind the Bears' net and tried a wraparound on Cassivi, who made the stop but gave up a rebound that Lapierre tucked in. Hershey didn't take long to respond as Klepis scored his seventh of the playoffs and fifth of the series at 18:42, depositing a rebound with a one-timer from the bottom the circle just seconds after Biron had left the penalty box. Notes: Hamilton never trailed in a single series in the 2007 post-season, defeating the Rochester Americans in six games, the Manitoba Moose in six and the Chicago Wolves in five. Benoit, who has four assists in the last two games, entered the night leading the Bulldogs with a plus-13 rating in the post-season. The paid attendance of 14,205 was the second-largest crowd ever to watch a Bulldogs game at Copps Coliseum. The Bulldogs were 0-for-9 on the power play, while Hershey also failed to score on its six chances.